We all know that you can easily install apps on your Android device by simply going to the Google Play Store’s website and selecting the app of your choice. Well now Google has made some new additions to their online store and has added some new features to make your app experience even more convenient. The ‘My Android Apps’ section has been updated and now included the option to remotely update apps as well as uninstall them. 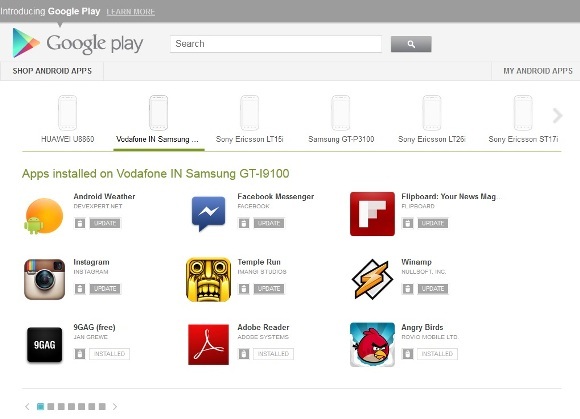 It will now show all of your registered Android devices and the apps that you have downloaded. Below each of your device you will see apps that you have installed on your device and another section below it shows all the apps that you have downloaded in the past but haven’t installed on any of your device. This is very convenient in case you format your device or lose your data by any chance, you can easily get your apps back in a jiffy. You can now also install updates and delete apps remotely. Apps will now have an update option and if you want to uninstall it you can simply remove the app remotely from the Google Play website. The changes are now live so do check out the updated Google Play Store website and check out your My Apps section.